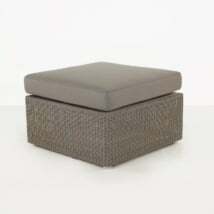 Shown above: 1 Antonio Sofa, 1 Antonio Club Chair, 1 Coco Side Table Tall, and 1 Fuji Pouf. 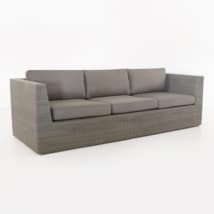 The Antonio Collection is an upscale synthetic outdoor wicker furniture collection made on a lightweight powder-coated aluminum frame and wrapped tightly to achieve a gorgeous tight, square look that offers a contemporary touch to any space. Made of premium synthetic outdoor wicker, the skirting of the pieces in this collection go all the way to floor, giving a beautiful completed look. 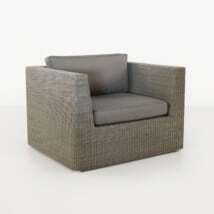 The collection includes a Club chair, two-seat loveseat, three-seat outdoor sofa and an ottoman. This collection is shown in “Stonewash”, a neutral off-white color that has a lot of depth in color and helps to tie any space together. 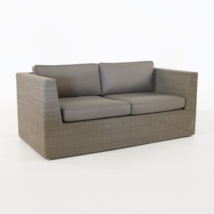 The Sunbrella outdoor cushions are included as shown.